I’d be lying if I said that part of the excitement that I felt about visiting Mexico City didn’t stem from a secret hope that it would be like a new Spain that happened to be on the same continent that I inhabited. Obviously I was also excited for many things that were very much Mexican and not Spanish at all; tacos al pastor, Día de los Muertos, lucha libre, etc. etc. etc. But I had also heard about a lot of Mexico City features that I hoped would transport me back to Spain in some small way. So, with this in mind, imagine my delight when I strolled into Mercado San Juan, Mexico City’s premier exotic foods market, and was greeted by a man who literally asked me “Would you like to try the best Jamón Serrano sandwich in all of Mexico?” Yes, man. Yes, I do want that. I cannot emphasize how crowded this place was, so I instantly believed that we were about to actually get the best ham sandwich in all of Mexico. We were given a menu and a rundown of the offerings by a very nice young boy, and decided to order a ham sandwich between the two of us. When we were asked if we wanted a whole or a half, well, that is where we made our mistake. The only negative detail of this outing was our decision to go for a whole sandwich instead of a half. Little did we know that meant a whole baguette and about 1-meter of carefully layered, very expensive Jamón Serrano. Mexico City was so delightfully affordable for us coming from the States that paying $20 for a sandwich was an absolute shock, even though we got our money’s worth and more. Again, no time for proper photographic evidence. Then the nice little boy who took our order asked us if we’d like to have a seat. The place was packed and there weren’t even chairs to be offered, but I said sure since he seemed to have a plan in mind. He then walked us to a completely different market stall and pulled out two stools for us to sit on right at the counter. 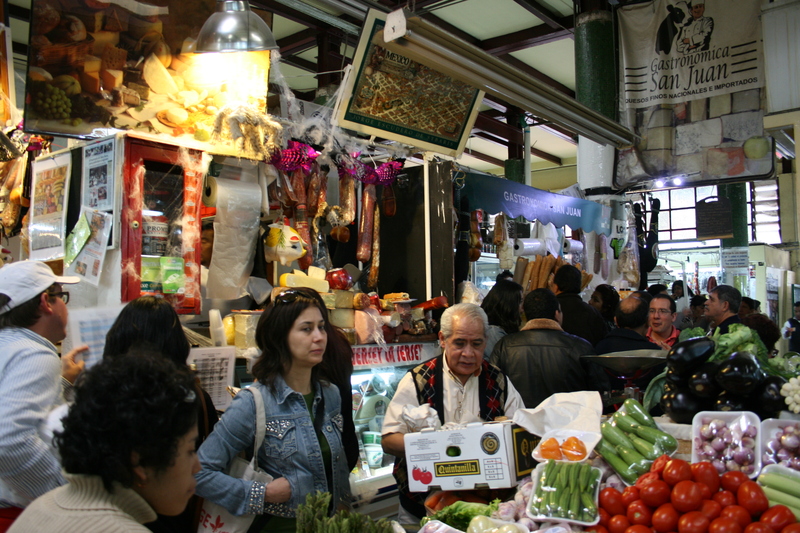 There was such a nice, community environment in the market and even though I must have been driving these people crazy with my lousy Spanish, they were so patient and generous with us. 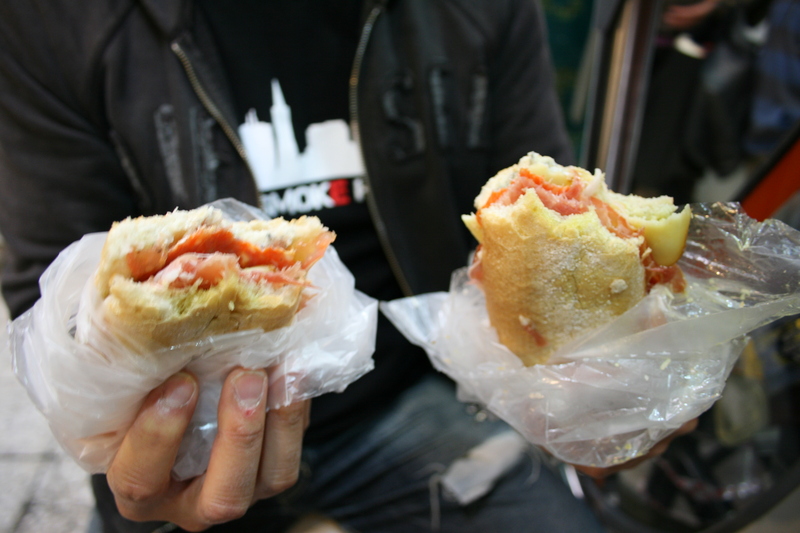 When we finished our sandwiches (we took half home in a bag…way too much ham!!) and our second little sipper of vino, the real treat came out. Dessert! 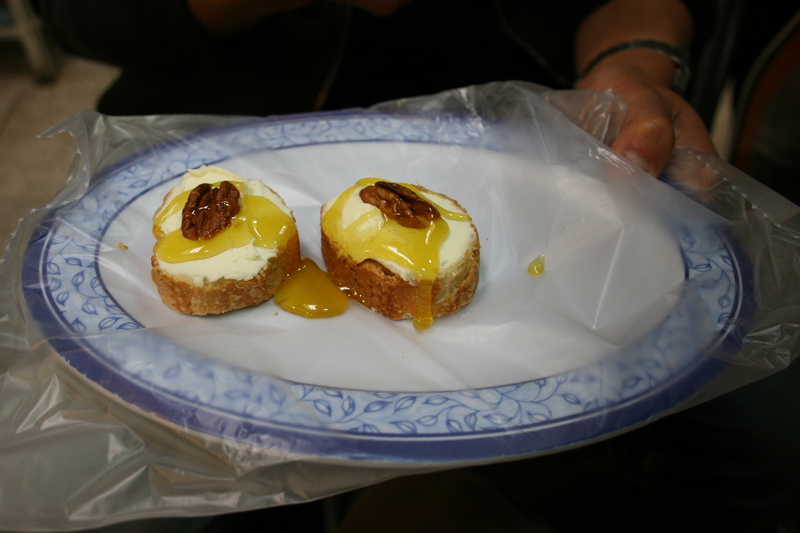 We had no idea what this was at first, but it ended up being a slice of baguette covered in ice cold mascarpone (or a similar cheese), then topped with a walnut and drizzled with honey. Ok, I thought. Kinda lame dessert, but cool that it’s free. Then I took a bite. Never has something so simple been so damn good. 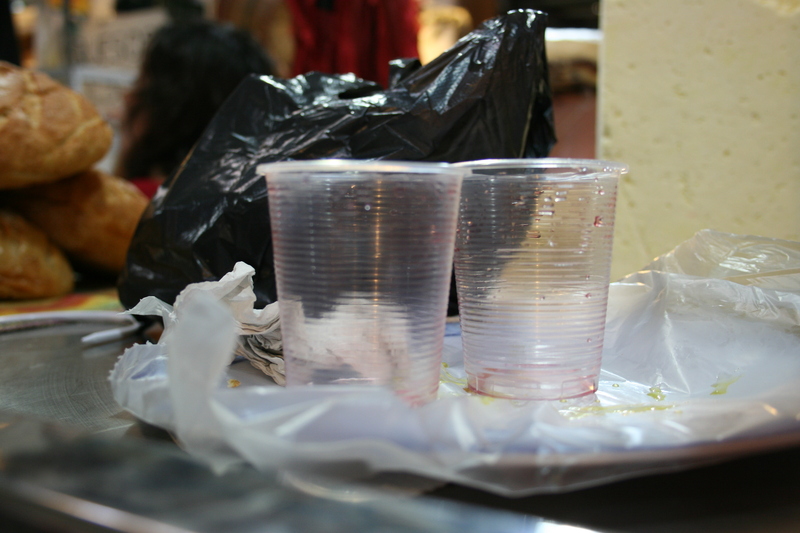 We ate these two with such voracity that the man helping us came over and gave us six more pieces to go, for free. He even wrapped up our little doggy bag in wax paper. Two of the additional pieces only made it as far as a coffee bar just down the aisle in the same market, where we had another delightful experience. We ate the others that afternoon. I have yet to recreate this simple masterpiece, partially because the memory of eating this in Mercado San Juan was so perfect. 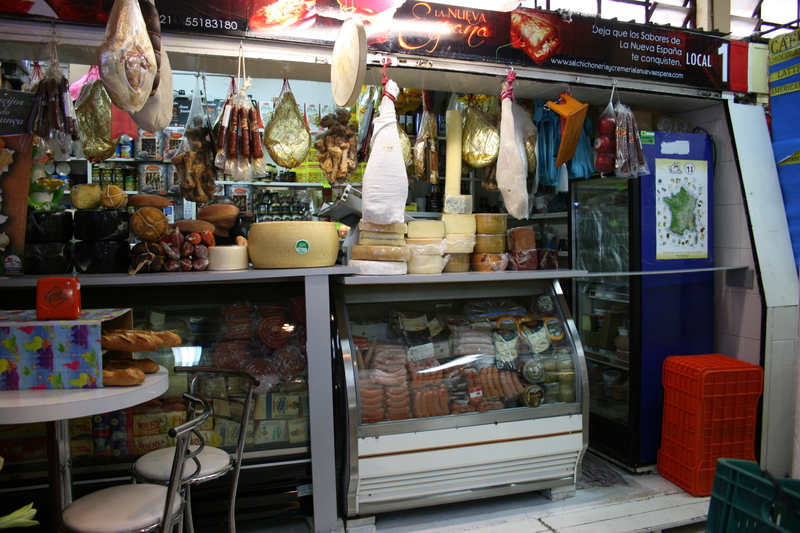 If you like Spanish foods (hams, cheeses, and sausages in particular), I cannot recommend a visit to Gastronomica San Juan enough. If you don’t know Spanish food, even if you hate it, I still recommend it, just for the wonderful service and awesome setting. It was a great way to kick off an even greater trip to the Mexican capital, and when I go back (which I definitely will), it will be one of the first places on my list to revisit. 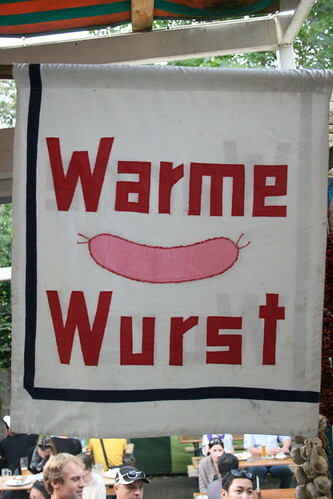 I’ll add another post soon with some pictures of the other market stalls, because they were just incredible. If you’d like some more information, you can check out Gastronomica’s Facebook page here. It will be helpful to speak Spanish at this spot, but if you don’t I have no doubt you will survive with a smile and some finger pointing. Just watch out for those enormous $20 sandwiches!!! I’ve lived in Barcelona, Madrid, and San Francisco. Three out of ten ain’t bad!! Find A Happy Place: The Top 10 Happiest Cities infographic by spacechimpmedia. An ofrenda, erected outside the Bazar del Sábado in San Ángel, a colonia in the southern part of the city. IMG_0311, originally uploaded by jhoolko. I don’t like pastries. They always seem like a waste of my appetite and my stomach space. I’d much rather eat a nice plate of pan con tomate, or some cheese and olives, or a piece of chicken, or nothing at all. Pastries just really came across as the unnecessary fluff of the food world to me, and not in a good way. That was until I stumbled upon a Portuguese bakery on my trip to Berlin last year, of all places. I was wandering around alone, a little hungry, and I decided that a little nibble of something sweet would do the trick. I had my first pastel de nata that day. And I realized that pastries could be good. Even after I got home, I couldn’t stop thinking about that custard tart. I tried, and failed, to make them at home. I sampled every variety of Chinese egg tart I could back in San Francisco, but they were all too eggy and silky and not creamy-custardy enough. When I booked my ticket to Portugal, I began to dream about them. I had the most vivid dream I’d ever had in my life, so realistic that I could smell the cinnamon dusted over the top of the pastry as I took my first wonderful bite, the light powder tickling against my nose, and I could feel the flaky dough cracking and crumbling into the custard as I nibbled away. Needless to say, my visit to Antiga Confeitaria de Belém was a pilgrimage of sorts for me. After visiting the Os Jerónimos monastery to get into the appropriate mood, we made our way over to the famed pastry shop. The inside is cavernous; room follows room in a seemingly endless chain of stark, tiled chambers, all warmed by the bodies of dozens of hot, happy people, enjoying heaping plates of pastéis and tiny cups of coffee. 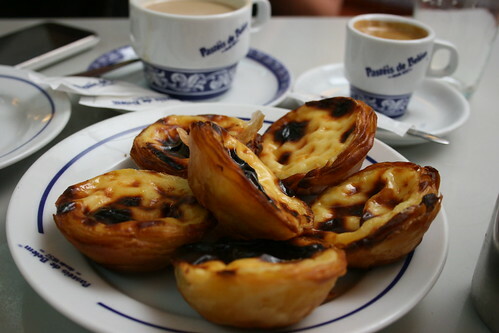 Portugal loves its pastries. Legend has it that the custardy varieties came to be as a solution to the excess of egg yolks that plagued the country’s monasteries and vineyards after the whites were all used up starching nuns’ habits and clarifying wine. That, however, does not explain the startling abundance of non-custardy pastries. There are pastries made of rice flour, of wheat flour, filled with beef and pork, or a combination of the two. Breads studded with dried fruit share bakery shelves with giant flour-powdered country loaves and tiny, colorful macarons, chicken pies smoosh up against stacks of buttery empanada-like cakes, stuffed with suckling pig (a personal favorite) and ridiculously large white cubes of meringue, topped with flaky layers of dough teeter against the window glass. These people cannot get enough of their pastries, and I must admit, seeing pasteleria after pasteleria and indulging in more than a few of them opened my eyes a bit to a wonderful world that I had previously refused to partake in. Absolutely starved, we decided to make a lunch of it, first sampling a pile of savory pastries with a round of small Sagres beers. We tried the croquetas; subpar and too sticky, though still hard to dislike what is essentially breaded, fried meat in goo form (at least for me). Chicken pies and pastries were tasty, but nothing to rave about, though the pastéis de bacalhau were perfectly, indulgently salty and greasy and exploding with flavor; the ideal bit-size treat to enjoy (in moderation) with a Portuguese beer. Then….the main event. After a number of feverish attempts to flag down our gruff and rustled waiter, garotos (the Lisbon-specific term for shots of espresso topped with milk) were ordered, as well as a modest mound of the most famous of Portuguese treats. And they were good. Freshly baked, warm, and almost runny compared to custard that has been allowed to cool, the pastry filling was an over-the-top treat, and the pastry itself was perfectly crisp and flaky. After several samples from other Lisbon outlets, none as fresh or as warm as the ones we tried in Belém, I must say that these were the best I had. It seems essential to have them straight out of the oven, and in Belém you could literally watch them making hundreds of these little gems at a time. I don’t know if pastries will be a part of my life now that I am back from vacation. Maybe because eating custard every day probably isn’t the best path towards a healthy lifestyle, or maybe because indulgent breakfasts aren’t as fun when eaten in your cubicle. Or maybe because I just haven’t found a Portuguese bakery yet. Like many people in my demographic (internet-loving females aged 18-30), I have recently discovered the wonders of Pinterest. Pinterest hasn’t really changed how much I use the internet, thank god, but it has changed the way that I remember things I’ve seen on the internet. If I see something wonderful and awesome, I am now able to bookmark it in a way that actually encourages me to go back and look at it later, and the collection of images (or “Boards”) that result from my daily flurry of bookmarking can really be quite lovely. Hopefully you agree! Right now it’s an unusual 80 degrees in San Francisco. Unfortunately I am stuck in my cubicle, and sadly I can’t even see a window from where I sit. So Pinterest-fueled daydreaming to the rescue! If I could be anywhere outside of this cubicle, I would want to be somewhere on the water. Sadly the nearest contender is the San Francisco Bay which isn’t exactly a tropical paradise regardless of the season. 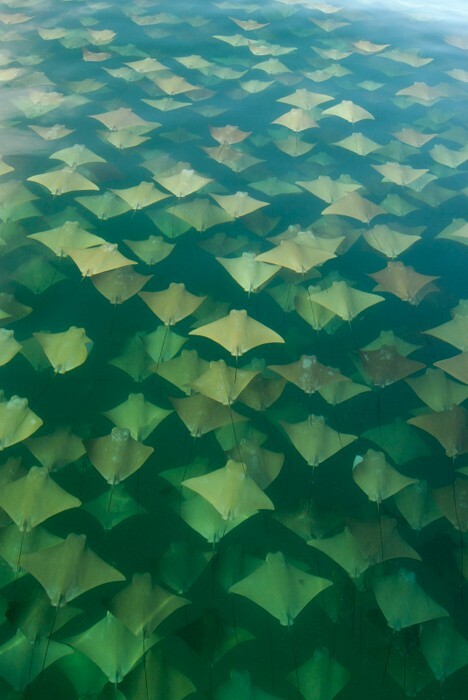 So here are a few places I’d rather be…. Oh my. This is so good. Even if you only understand a fraction of it, this is a witty, entertaining, and talented take on the frustrations involved with learning a global language like Spanish, with all its differences around the world.